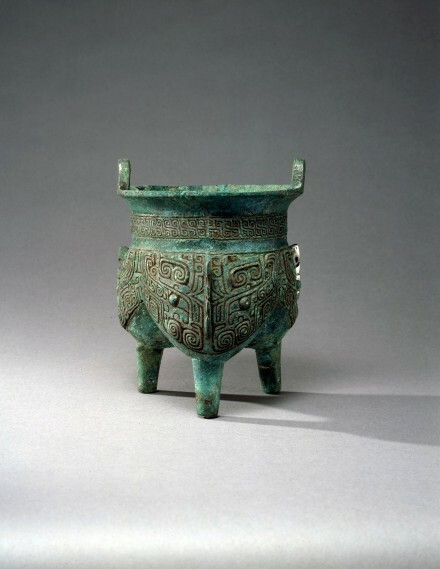 the deep bowl divided into three equal lobes, each supported on a plain tapered leg and very well cast in varied relief and deep intaglio with a taotie mask made up of a pair of elaborate kui dragons confronted on hooked flanges, the kui dragons each with a rounded boss for the eye below raised 'C'-scroll horns and with twin spiral scroll motifs in graduated relief below the eye to serve as the snout, the open mouth framed by a hooked scroll motif for the lower jaw, and with a wing-shaped tail formed by a cluster of scrolls rising behind the eye and beside the horns, elaborated with further intaglio scroll motifs and linear details overall, the decoration very sharply defined by an infill of black pigment, the short neck of the vessel decorated with a raised frieze of interlocking twin spiral scrolls in a repeating pattern, cast in intaglio and filled-in with black pigment, the wide flaring mouth with squared lip and surmounted by two upright loop handles, the surface very well preserved, with lightly encrusted malachite green patina overall, giving excellent contrast to the black-in-filled ground, scattered uncorroded areas showing the original silvery surface of the bronze. Compare the bronze li in the Shanghai Museum, of closely related form with different stylized masks and hooked flanges, illustrated in Zhongguo Qingtongqi Quanji (Compendium of Chinese Bronzes), Vol. 4, Shang, section 4, p. 26, no. 26, with description on p. 9.